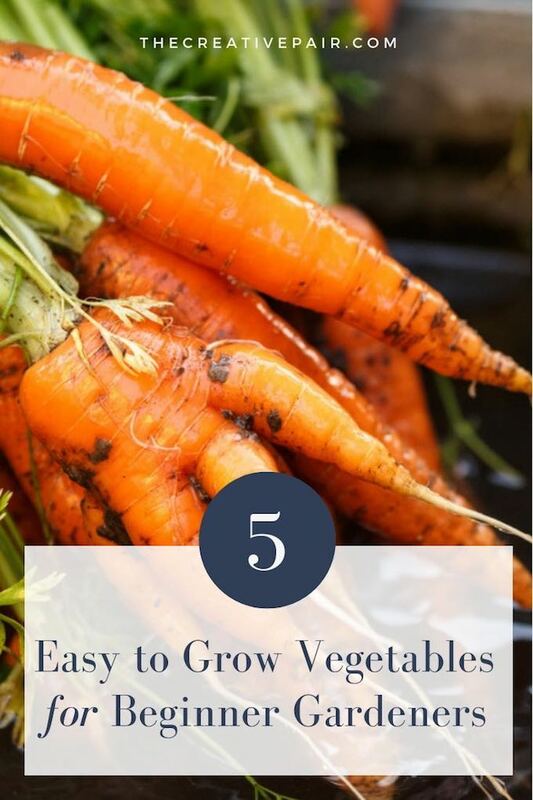 These 5-easy to grow vegetables for beginner gardeners help ensure successful gardening. The reasons to grow your own food are many. Some of those include concerns about GMO food or the rising cost of groceries. Organic gardening is a viable way to avoid GMO foods and to reduce your grocery costs. These five easy-to-grow vegetables help beginners to become gardeners. 1. Garlic. Garlic is super easy to grow. You simply have to stick a glove of garlic in the ground and water it. Garlic is planted either in the fall for warmer climates or in late spring in colder climates. The correct way to plant garlic is to work the soil about a foot in depth. The finished soil should be soft, silky and free of clumps. Using the end of your shovel (or another garden tool) make a small one-inch depression in the soil. Place the clove of garlic with the pointy end facing upwards into the depression and cover it with dirt. Garlic should be watered once a day until it sprouts. Then it should be watered every other day until the shoot is six-inches tall. After that is should be watered every third day. 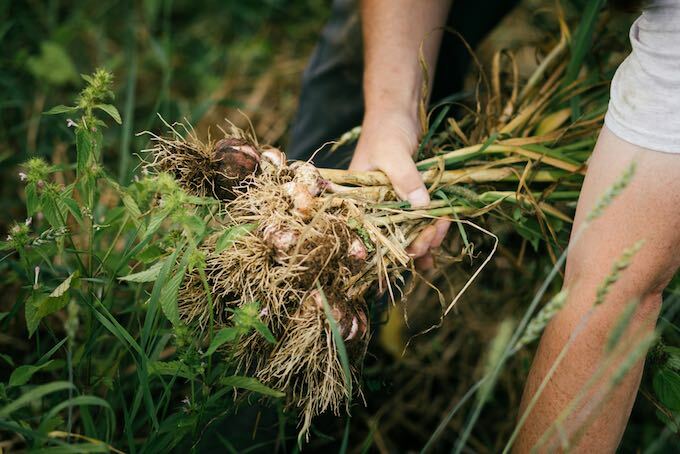 Harvest garlic in June or July when the stocks have turned halfway brown. If it should flower, snip off the flower so that the plant puts energy into producing larger bulbs. 2. Kale: There are a few varieties of kale available for gardeners. The Red Russian Kale seems to be the least bitter. 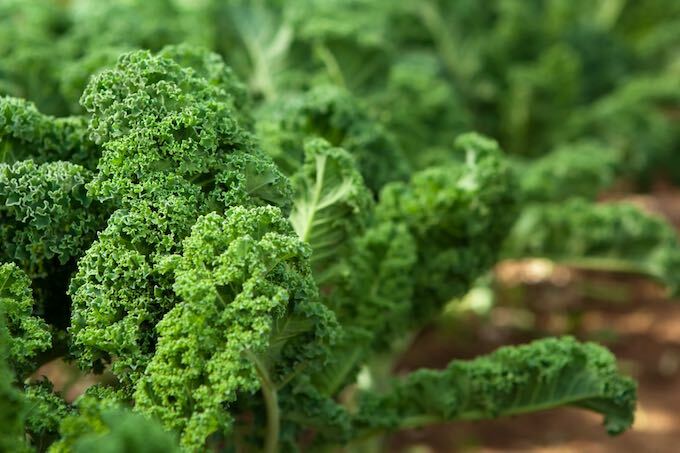 Kale is super easy to grow, and it works perfectly as a cutting green. To cultivate kale, turn the soil down about one foot in depth. Make sure the soil is free of lumps. Using the edge of a hoe or rake, make a shallow ¼ inch deep furrow down the middle of the row. Plant the seeds about four inches apart. Some gardeners plant the seeds close together and then thin the row later. Once you plant the kale seeds just gently pinch the furrow closed. Water every day until the seeds sprout and continue the daily watering until the plants are about four inches tall. 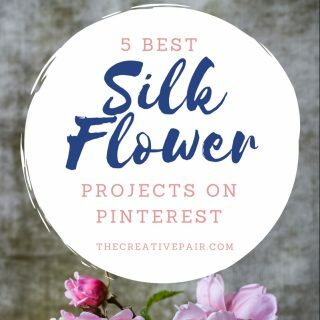 Once the plants are four inches tall, water them every other day. Begin to harvest when the plants are six-eight inches tall. The best way to harvest is to snip off leaves selectively along the entire row instead of harvesting a single plant. Two rows of Kale that are ten feet long should supply a family of four with ample greens all season long. 3. Carrots: There are many varieties of carrot, and they come in more colors than just orange. A good trick to get kids to eat more vegetables is to let them help plant vegetables and then care for them. Carrots are easy to grow, but they require diligence. These colorful root vegetables have a long germination period of about 20 days or longer. 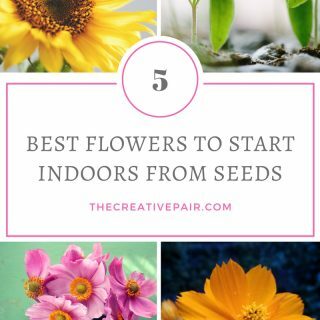 That means that once you plant the seeds they require watering every day for 20 days. 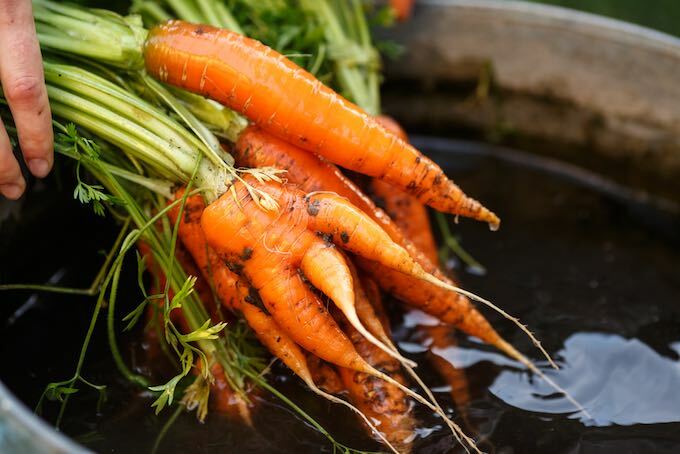 To plant carrots, work the soil to about 18-inches in depth. The soil should be silty so that the carrots have an easy time growing straight down. A good tip is to dig a trench and fill the bottom four inches with chicken manure. Then fill in the trench. Using a hoe or rake, create a ¼ deep furrow. Plant the carrot seeds about three inches apart. This will give the carrots room to grow without over competing for nutrients with their neighbor. Competition between vegetables causes stunted growth. 4. Beets: Growing beets is super easy. There are the red ones and golden beets. Both are awesome when steamed. Beets make a wonderful side dish, or as an addition to a salad. They are also good pickled. A good tip for cooking beets is to peel them, slice them into 1/3-inch rounds. 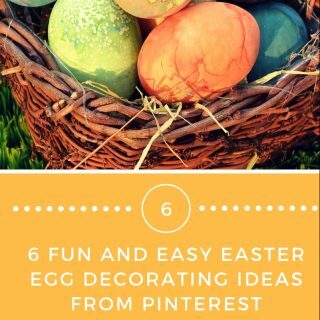 Lay them on a piece of foil. Add salt, pepper and either sprinkle them with garlic powder or add a clove of garlic. Drop a teaspoon of olive oil onto the beets. Fold up the foil into an envelope and back at 350 degrees Fahrenheit for 20-minutes. The result is a tender beet with a ton of flavor. To plant beet seeds work the soil to a depth of one foot. The soil should be finely works and free of clumps. Make a furrow that is about ½-inch deep. Plant the seeds four inches apart. Beet seeds are larger, so it is much easier to plant them. Water every day until the plants are four inches tall. Harvest beets when the top of the bulb is wider than an inch in diameter. 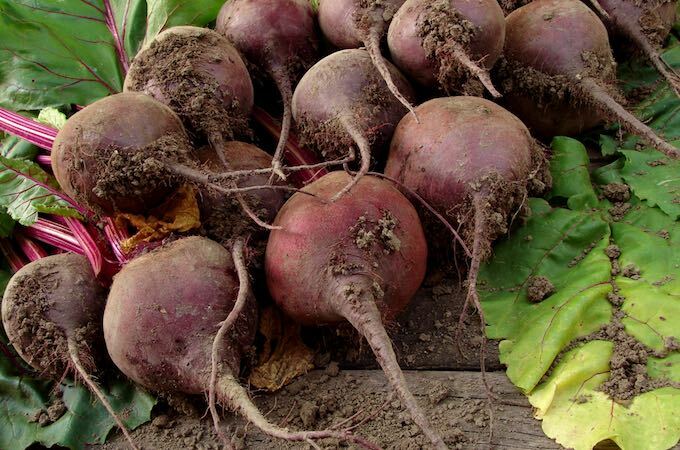 Beets are best when their bulbs are between one and three inches in diameter. 5. Swiss Chard: Chard is another easy green to grow. There are a few varieties that do well in most gardens. Swiss chard is very leafy, and the stalks are white. A hardy variety is rainbow chard that comes in a variety of colors, such as yellow, red, and magenta. Chard is a very beautiful plant. To plant chard seeds, simply work the soil to a depth of about 18-inches. Soil should be free of clumps and full of organic matter. Supplement the soil with compost if needed. Using a hoe or rake, created a furrow that is about 1/3 inch deep. Plant the chard seeds one foot apart. Chard grows to be fairly wide and tall. Water it every day until the plants are about four inches tall and then water it every other day. The plants are harvestable when they get to about eight inches in height. Like kale, just snip off the leaves that you want. The medium-sized leaves are the best ones for steaming. Four to five chard plants will keep a family of four in greens most of the season. Notes: It is usually best to plant at least two types of greens. Other easy greens to grow include collard greens and spinach, which you plant as though you are planting kale. Helpful Tip: Successive gardening is a trick to use when you want to extend a crop. For example, if you plant 100 carrot seeds they all are ready nearly at the same time. Can you use 100 carrots all at once? Usually not. To solve the problem, gardeners use successive gardening. Instead of planting all 100 carrot seeds at once, plant 20 seeds every two weeks. You can adjust the number of seeds you plant based on your use of these foods. If you continue to plant in the successive method, you will never run out of carrots. Gardening is not difficult. 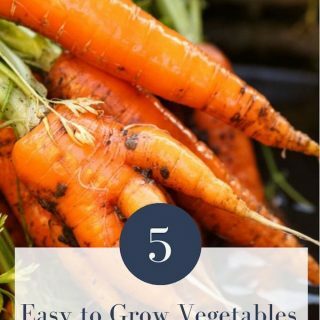 These five easy-to-grow vegetables represent an excellent place from which new gardeners can begin the journey of growing food. The benefits include healthier food choices and a decrease in the cost of buying food. The real benefit is the satisfaction of preparing a meal from produce that the garden has grown. 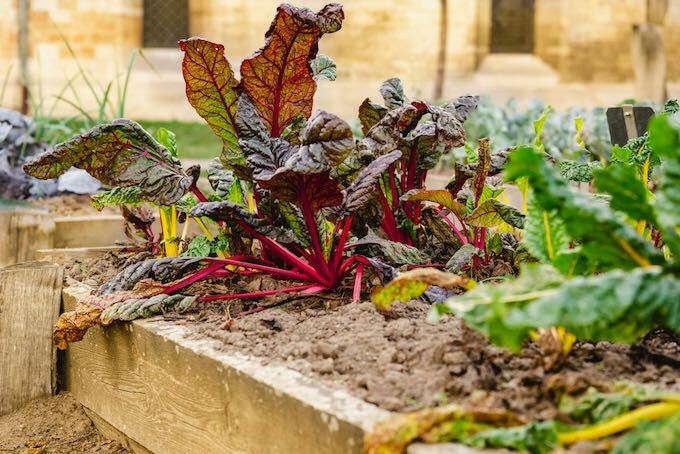 So whether your motivation for gardening is over GMO foods or the rising cost of groceries, these five vegetables help get new gardeners started down a successful pathway. Here is to happy gardening and wonderfully healthy meals!